If you have a little patience & enjoy playing card games, you�ll find that learning the rules of Texas Hold�em is quite easy and it�s a very enjoyable game. Below you will find an in-depth overview of the basic rules you need to learn to get into the game. This is an extremely detailed account of learning Hold�em and is meant for pure beginners. If you�re already somewhat familiar with playing poker and need a brush up, I suggest reading our how to play Texas Hold�em article which provides a brief overview vs. an in depth article. The thing with Texas Hold�em is that each round doesn�t necessarily make it to a showdown, since there can be up to four different rounds of betting during the game, and players can throw away their hand if they aren�t willing to pay the price to continue. The four main rounds of betting in any Texas Hold�em game are Pre-Flop the Flop, the Turn and The River. Each of these rounds works differently and are very important for beginners to understand. We�ll discuss them in detail a bit further into this article, but let�s start with a basic overview of the typical progressions involved in playing Texas Holdem. Below is a simple overview of the various elements involved in a Texas Holdem game including the rounds of betting as well as various rules for playing. The Blinds - Once you have bought your chips and taken a seat at the table, the first thing you need to know about are what are called the blinds. The blinds are two different wagers that must be placed by players before the round begins. There are two types of blinds � the small blind and the big blind. The big blind is two times the amount of the small blind, and these are used to start the action on the table as well as dictate the table limits. For example, when you go to a poker room you will see things like $1/$2, $5/$10, $10/$20 and so on which are the blinds of each game and what you�ll have to put up according to the dealer button. The Dealer Button - The dealer button is a small white disc that says dealer and it dictates where the blinds are at any given point during the game. Since the actual physical dealer at the table is stationary, the dealer button allows each seated player to have a virtual turn as the dealer which really just serves to keep the blinds rotating throughout the game. The dealer button moves from left to right around the table and the blinds are always left of the button, so one seat to the left would be the small blind and two seats to the left is the big blind. This is important as the blinds determine who acts first each round. This continues as long as the game is running to ensure that every has to put up the blinds when it�s there turn. In order to enter into any one hand, you must pay at least one big blind if your buying into the game for the first time. The Shuffle & Deal - Once the blinds have been put on the table (called posting the blinds) the dealer will being shuffling the cards to being the round. Once shuffled, the dealer will deal 2 cards face down to every player who is in the game which are called their hole cards. Once you have received your hole cards you are allowed to check them to see what you have been dealt, however one of the rules is that under no circumstances can you show your cards to another player who�s involved in play. Pre-Flop - Once all the players have been dealt their hole cards, the game begins starting with the player immediately to the left of the big blind. This round of the game is known as pre-flop action since the community cards have not been dealt. At this point, the player to the left of the big blind (sometimes called under the gun) must make one of three different decisions. The player can fold if they aren�t happy with their hole cards (this means you don�t have to put up blinds or any money until the next round). The player can call meaning that they put an amount equal to the big blind on the table. Lastly, the player can raise which means they increase the amount needed to call. If you are raising always keep in mind that the rules state you must make a raise of at least two times the big blind, unless you do not have enough chips in which case you would be all-in. Once the player under the gun has made their decision for the hand, the turn moves to the player immediately to the left of them and continues around the table until everyone�s decisions have be made. Once the first player acts, the next player can choose to fold, call, raise (if no raise made) or re-raise. About All-In � if you raise all of the chips you have in front of you it�s known as going all-in. If you do this, players must call the entire amount of your all in to participate in the round, or if they have less chips, must also go all-in with whatever they have left. If your all-in is more than the amount of chips of a player who calls, you would just be "all-in" with whatever their chip count is, and if you were to lose the hand only would pay out their chip stack amount. This rule only applies in No-Limit Texas Hold�em, whereas Limit Hold�em and Pot-Limit Hold�em do not feature all-ins and have other rules for their betting. The Flop - If there is more than one player left after pre-flop betting (if there is any) then the next stage of the game is what�s known as the flop. On the flop, the dealer will place three community cards on the table which every player can see. By combining these cards with your two hidden hole cards you can begin to see the possible hand ranges that you might be able to make by the end of the round. Remember that there are still two more cards to come so you should think of the flop as opening up possibilities rather than sealing the deal, that is, of course unless you flop a made hand like a Royal Flush which absolutely can�t be beat. Once the flop has been dealt a round of betting begins with all players remaining in the hand from the pre-flop and moves from left to right from the dealer button. The player to the left of the dealer button now has to make the decision to check (not raise or fold) or to make a raise which must be called for any of the other players to continue. If the first to act checks, the remaining players in the hand can also check (meaning no bets and a new card) or the other players can choose to raise or re-raise any bets that have been made. If there are still players in the hand after this round, the next step is the dealing of the turn. The Turn - The turn is the next step in the game and with this stage only one more card is dealt, meaning that currently you have your two hole cards plus four cards showing on the table. 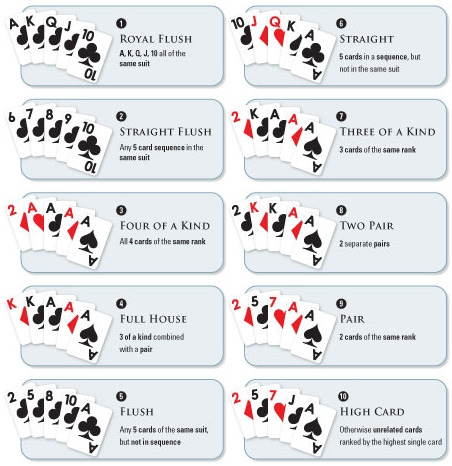 The action starts with any players still remaining in the hand and moves from left to right with each player being able to check, call, raise or re-raise as they see fit during the round. Once the betting has taken place if there are still players in the hand the final stage known as the river happens. The River - On the river, the fifth and final card is dealt on the table and you know have your two hole cards plus five community cards in play. Using your hole cards in conjunction with the five cards on the table you make your five card poker hand. It�s important to note that you can use only one card from your two hole cards at this point meaning for example if you have one diamond in your hole cards and there was four diamonds showing on the poker table you would have a flush. Once the river has been dealt, the players left in the round start acting from left to right and can check, call, raise or re-raise depending on what happens. If one player raises and the other folds, you don�t have to expose your hole cards and there is no showdown. If both hands are checked or there is a raise and a call, then both players must expose their cards to the table known as a showdown. The Showdown - Assuming the hand has made it to the end of the river and a bet has been called or both hands have been checked, the players must now turn their cards face-up to be compared against one another. At this point, the higher hand according to five card poker hands is determined and that player wins any money in the pot which has been bet through the entire round of play. If there is a tie than the money in the pot is split equally between the remaining players, otherwise the winner is paid and a the dealer deals a new round of cards to players.